I realized this past Sunday that Cardio machines are not my favorite way to enjoy aerobic exercise! I would much rather do a Boot Camp style workout for 60 minutes then do the elliptical for 20 minutes! I did an elliptical interval and the whole time I was thinking about jumping rope and other ways I should’ve been doing my cardio. I rarely ever hop on a machine so I stuck with it, but now I realize why I usually choose other forms of cardiovascular exercise! Trainer Tip Tuesday #5: Chose workouts that you enjoy doing!! If you aren’t enjoying your workouts you most likely won’t stick with them. When I am not teaching classes, I enjoy doing bodyweight circuits, kettlebell circuits, agility ladder work, Insanity or T-25 workouts. 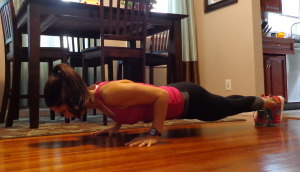 I also love practicing Push-ups. 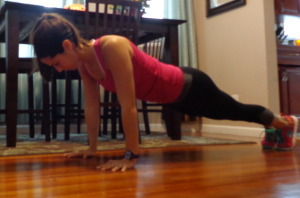 My Tricep Pushup is finally bacK! It took me a long time to build up my Tricep Pushup strength since my shoulder injury, but now I can complete multiple sets! Choose an exercise activity that works for your health. Make sure you are cleared for exercise by your doctor and they approve of the activities you want to participate in. Join a class. Classes keep you motivated and they usually have the same class times each week which makes it easier to have it set in your schedule. Classes also have great music and a set workout plan. Choose exercise that works with your schedule. Does your class fit in with your work schedule? If you don’t have time to get to the gym, find a workout that you can do at home with minimal equipment, or get outside and go for a run before work if you like being outside. Choose exercise that trains all aspects of physical fitness. I am a huge fan of boot camp class because we work on balance, cardio, & strength. Some classes only focus on strength training or only cardio so you will need to find other days to fit in the exercises you aren’t training. Workout with a friend. Having a friend or family member to work out with holds you accountable and will help to keep you motivated to stay on track! Do you have any tips for finding exercise that you enjoy? What is your favorite type of exercise? How about your least favorite! ?